I have officially contributed to the early onset of Halloween by purchasing one of my favorite lines of t-shirts at Target -of the Halloween variety. 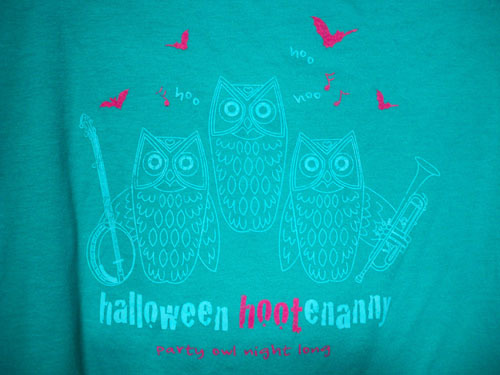 I couldn't resist something that had both owls and the word "hootenanny". Ohh this is adorable. I need to make a trip to Target! ah. must have. owls with a banjo and a trumpet. it is destiny! I've been to several Targets and haven't found *this* one! Argh. Pretty please, could you find the item number so I can harass the customer service to look for some in my area? I'll keep looking, too!